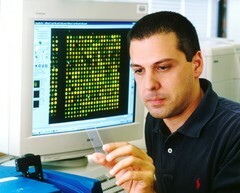 An adult caucasian male laboratory technician sitting at computer that displays a microarray. DNA microarray technology is a powerful new research tool that allows scientists to assess the level of expression of a large subset of the 100,000 human genes in a cell or tissue. This technology can quickly produce a snapshot of the genes that are active in a tumor cell, critical information in narrowing the precise molecular causes of a cancer.